After each shower I use colloidal silver in a spray bottle and while still damp I go over that with a Lafes mineral crystal. It kills the bacteria that cause foul odor and lasts all day. Works well for me according to others. Also, I gargle and brush with the colloidal silver to prevent bad breath using a flouride-free toothpaste. Be sure to try our Lavender Silver Hydrosol spray! I also use colloidal silver as a body spray but with Lavender essential oil mixed with it. How do you mix an oil with water? It's easy!! 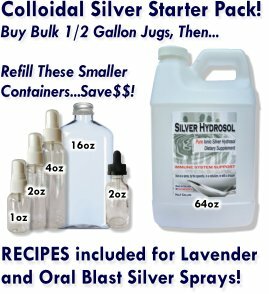 Simply take the spray bottle, fill it with colloidal silver hydrosol, then add 7 drops per ounce of colloidal silver, screw on the sprayer, and tap the spray bottle on a hard service until the liquid is opaque! That's it! The oil has been emulsified into the water using sound. Lavender essential oil and colloidal silver are a potent team that I enjoy using!